In the faded photo below, men will notice the rare Harley-Davidson motorcycle; women will notice the tall man with dark eyes. 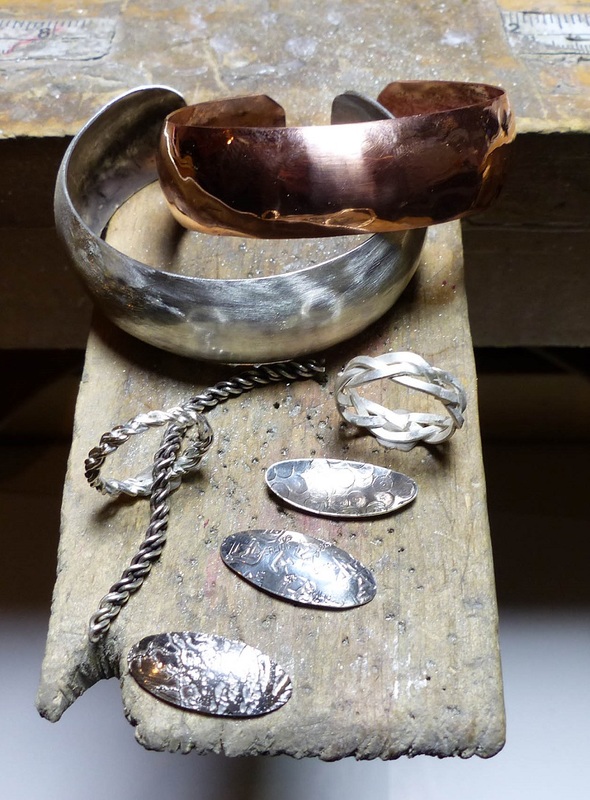 But the reason I’m posting this image on a jewelry blog is because it shows Miland Suess, one of the most creative makers of jewelry tools for metalsmiths, including high-quality forming pliers. 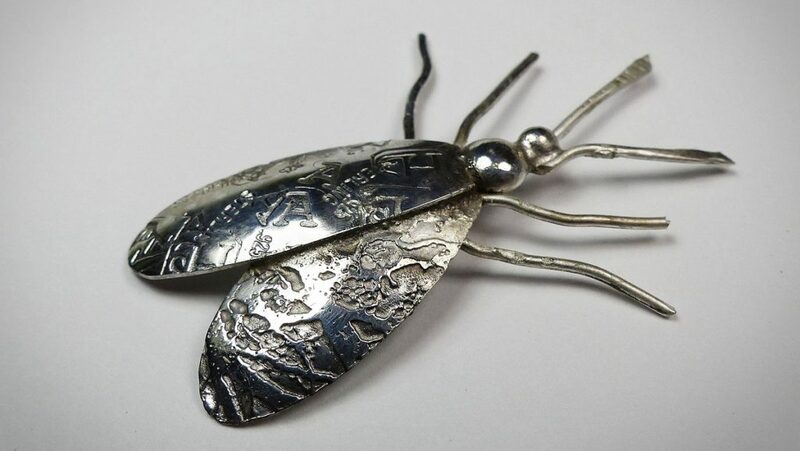 ABOVE: Sterling silver study of moth made with Miland’s synclastic pliers. Recently, I tested his sturdy synclastic pliers, now being made by EuroTool and offered by Interweave (along with anticlastic pliers). These shiny beauties pack plenty of heft, and their high quality makes them a pleasure to use on problem projects where nothing else will work. I was able to find Miland’s son, Dana Suess, and learned that Miland (pronounced My-land) died three years ago in his 90s. Dana also provided photos and offered numerous stories about this lifetime mechanical whiz. 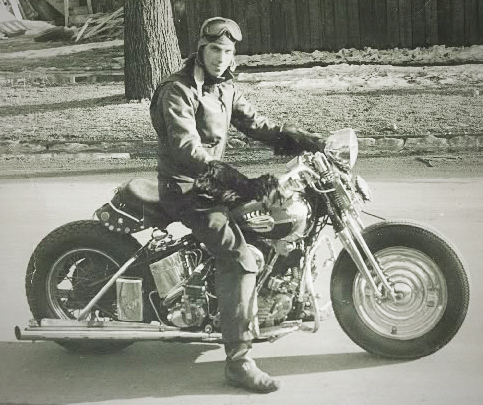 According to Miland’s vintage website, he worked as a Harley-Davidson mechanic in his teens. Then World War II came along, and he found himself serving as a rear gunner on a dive bomber for the US Navy. Surviving that, he worked as a police sergeant in the Chicago area and raised a family of five. When he retired, he then turned his talents to making and selling specialized jewelry tools and other hand tools as a business and moved to Tucson in 1984. “He had this natural ability to look at a problem and come up with a solution and voila!” says Dana, who worked with his dad. Like the time some university professors asked Miland to improve pliers used to secure identity tags to the wings of flying bats they were studying. Instead of punching a ring through the skin, Miland created a pair of pliers that crimped the tag onto the bat without tearing the delicate skin, Dana says. He also altered Klein tools for electricians so that one pair of pliers could do the work of three tools. Then during a Tucson gun show in the mid-1990s, Miland was demonstrating how his tools worked, catching the attention of some nearby jewelers. 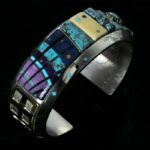 “One jeweler watched his demo and realized all of the time he could have saved during his career if he had the tools,” says Dana. Of special interest were conforming dies attached to pliers, which could produce compound or synclastic curves. These jewelry tools were patented in 1996. However, Miland made every one of his tools by hand, so it took him weeks and months to fill orders. And with his death, his remarkable contribution to the industry was at risk of dying, too. See short videos of Miland’s pliers in action, and see part two of this article for more of Miland’s tools. Get Miland’s anticlastic and synclastic pliers, along with other jewelry tools, in the Interweave Store!